What started as a hobby in 1981 (tractor collecting) and something our whole family enjoyed doing; slowly evolved into a business. We sold tractors and tractor parts locally until 1998 when a friend gave us his old computer... and the rest, as they say, is history. 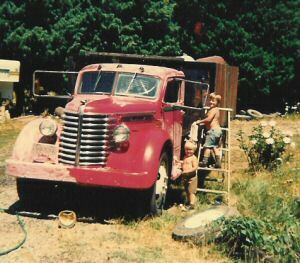 1949 Diamond T farm truck. 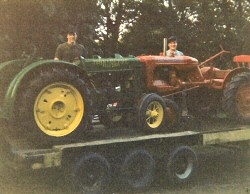 Sons Tony with his John Deere B orchard and Brian with his Allis Chalmers B loaded onto the trailer... headed to the Oregon Steam-up at Brooks, OR in 1990.